The 17th annual Taste Washington featured dozens of restaurants. Each of those restaurants came up with a Pacific Northwest inspired bite that had their own signature. It was an inspiring array of dishes that you could put together for your next wine tasting. From savory desserts (olive oil ice cream) to oysters on the half shell, scallops and salmon, with pork bellies, steak, lamb and cauliflower, beets, sweet potatoes, arugula, Taste Washington left no culinary stone unturned. This tastings tapas-styled food bite was absolutely necessary when you are walking around with a wine glass, small food tray with the wine glass holder, program, pen, and, in some cases, a spit cup. That’s a lot of stuff to juggle with just two hands. Following is the short list of the bites that inspired me and a Washington wine that I did or would pair with the little dish. Paella Seattle Dished up the classic paella recipes of Valencia, Spain, which means chicken, pork and Bomba rice with green and red peppers, onions, garlic, green beans, sweet peas and artichoke hearts. Gotta go with the Tempranillo grape here. Michael Florentino Cellars, Naches Heights Vineyard, Camaraderie Cellars, Cave B Estate Winery, Fall Line Winery, Kana Winery or Stottle Winery all do a rendition of Rioja, the Spanish classic red with paella. The Washington State Wine Commission launched Taste Washington in 1998 and is now produced by Visit Seattle. 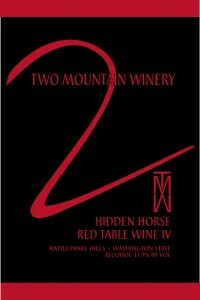 For more information, visit www.tastewashington.org. A friend bumped into a guy the other day who is well known in beer circles. The beer guy was in need of a Sound beer and headed to the brewery in Poulsbo. My friend was also there enjoying a Sound beer and the two beer geeks got to talking about wine. And that’s how I found out about this lovely Bordeaux blend from Columbia Valley. It turns out this beer guy is a fan of the Flying Dreams Sidekick 2009 Columbia Valley Red Blend. Curious about what a fine beer drinker thinks about red wine, I tried one. And I’m real impressed with this blend of Cab Franc, Merlot, Malbec, and Cabernet. Sidekick is an easy drinking wine with lush fruit flavors and wonderful aromas. After years of research, I know anything that is made, be it beer, wine or tonight’s dinner, requires quality ingredients to be the cream of the crop. Great wines start in great vineyards. Flying Dreams Winery sources their grapes from some of the most prestigious vineyards in Washington: Stillwater Creek, Boushey Vineyard and Stone Tree Vineyard on the Wahluke Slope, Red Willow, Upland Estates, Sagemoor, Spring Creek, and Red Mountain. I’m not familiar with winemaker Leroy Radford, however the website says he’s “passionate about winemaking since his first vintage in 2005.” But what really grabbed my attention were the Spanish varietals in their stable — Monastrell and Garnacha — which are the same as saying Mourvedre and Grenache. Another Spanish grape that Flying Dreams ferments is the classic Tempranillo which Rioja makes famous. Spanish wines, especially the ones from Rioja, emulate Bordeaux with regard to oak aging and cellaring. There’s a whole book of regulations in Spain about how to do it and what to call it. But that’s a story for another day. Suffice it to say that some Spanish bodegas even use American oak when making wine. Pretty interesting considering how close Spain is to all that wonderful, highly prized and expensive French oak. Keep your eyes on this one, it’s worth a glass or two. The 2009 Sidekick Red Blend is 36 percent Cabernet Franc, 30 percent Merlot, 25 percent Malbec, and 9 percent Cabernet Sauvignon and retails for around $25. Side note: Washington craft breweries, at about 240, are dwarfed by the 740-plus wineries in Washington.